Pretty sure that they compute the average monthly return or average annual return based on arithmetic means. How do you count arithmetic means anyway? What is the fallback of this method? The computed average return on investment is bigger than the reality. 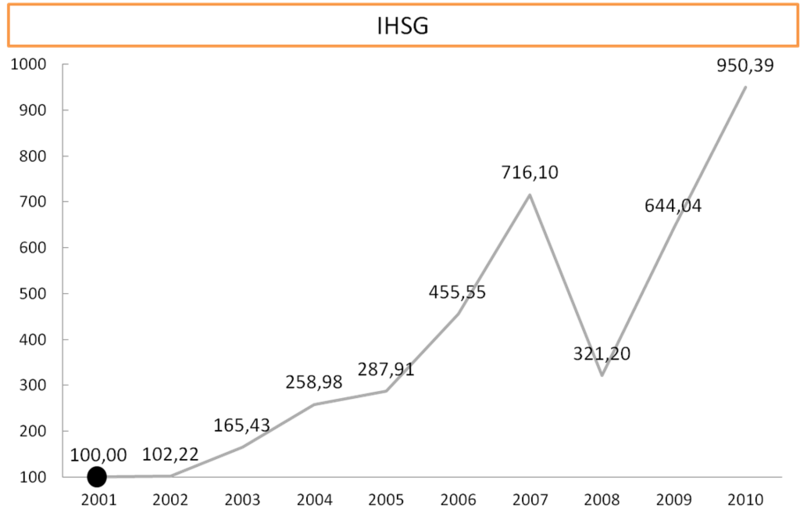 If you want to test it, then try compounding the average return of IHSG by 37,32% and you’ll get a number a lot bigger than 950,39 (base year 2001 = 100). We cant use the arithmetic means because it doesn’t account compounding return involved in n period. The biggest fallback is that if your return on investment is –50% in a year then how much gain should you get next year to recover it? 50%? No, its 100%. Check: You have $300 and in 2006 your return is –50% then your money in the start of 2007 is $150. If you want to recover to $300 you should get another $150 from a $150 investment (100% return of investment). Your average annual return is NOT (-50%+100%)/2 = 25%. The correct answer is 0%. Okay, if we cant use arithmetic means then what how should we measure the average return of investment? We should use geometric means. Easy though. Just divide your current investment account and divide it by amount of money you start investing and root it by n-1 years then subtract it by 1. Try compounding 28,427% and you’ll get the correct annual return on investment for years you have been investing. You might like to download this excel spreadsheet (arithmetic vs geometric return). Now, make sure that the investment manager return on investment is computed using the geometric means. A geometric means will always show the lower return on investment and that’s why many investment manager wont compute the return using that method. That’s the point =P Now, consider switching investment manager? hehehe..